Phone line – A separate phone line will be established for your ATM transactions. This exclusive phone line will only be used for your ATM customers and will avoid any busy signals or line disruptions. Analog lines are suggested. Internet Connection – Through your internet connection, a direct line can be established for your ATM to connect to our transaction centers. We use only SSL encrypted devices for the highest level of security. 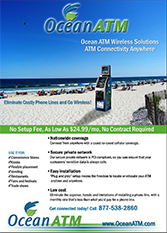 Wireless – Ocean ATM will provide wireless SSL encrypted cellular devices for remote or hard to wire locations. We will use wireless devices for mobile or temporary setup when needed.